The Jordan Brand vowed to make waves once again this year and they are living up to the expectations. This month the famous shoe outfit is hitting strides and they are going to make noise once again with the release of a new edition of the Jumpman H-Series. 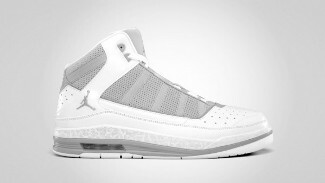 One of the newest models in the long list of Jordan Brand shoes, the Jumpman H-Series will come out in a White/Metallic Silver-Wolf Grey colourway, which looked very promising with its soft color combinations. The wolf grey H-series features a predominantly white upper with wolf grey touch on the lace area and Jumpman logo plus an elevated ankle cut and visible heel Air unit combined with a Jordan 2 outsole. Grab one now and you’ll never regret it.